Decals from LPS Hobby in Brazil are few and far between, but it is always a delight when they arrive. 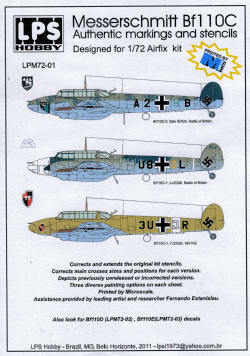 In keeping with many of their larger scale releases, this sheet is for the Bf-110. 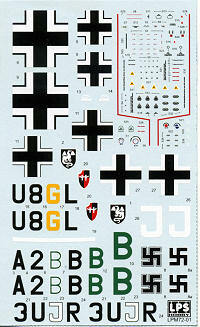 In particular, the newly tooled Airfix Bf-110C and offers three markings options along with a full set of stencils. The stencils are accompanied by a full size placement sheet that shows exactly where these are placed. There is also an excellent placement and painting guide for the three options. The decals themselves are superbly printed by Microscale so no worries on decal solutions. First up is a Bf-110C-2 with Stab II./ZG 2 during the battle of Britain. This aircraft is is RLM 71/02 /65 but is in a unique camouflage scheme without the splinters and with large mottles all over the upper surface of the airframe. Next is a more standard scheme 110C-1 with 3./ZG 76 at the same time. This aircraft has a white nose and a thin white band over the rear fuselage. The third option is an aircraft from 7./ZG 26 in North Africa during 1941/42 in desert camouflage. There are enough common markings and stencils to completely do one of the three options. Of course, you can use kit decals to do the others should you so wish. If you are into 1/72 110s, you really need to look into getting this or the other LPS sheets. Thanks to LPS Hobby for the review sheet. You can find these at Hannants or contact them at lpsi1973@yahoo.com.br .